Postharvest texture change is a fundamental question for fruit growers and breeders as it drives consumer acceptability. To decipher the genetic control of fruit texture, we studied an apple segregating population over 2 years at harvest and after 2 months of cold storage. Texture complexity was dissected in quantitative traits, related to (i) sensory perception of fruit quality and (ii) fruit mechanical properties. Genetic models including storage, genotype and their interaction effects were built. After selection of a model, broad sense heritabilities were estimated. 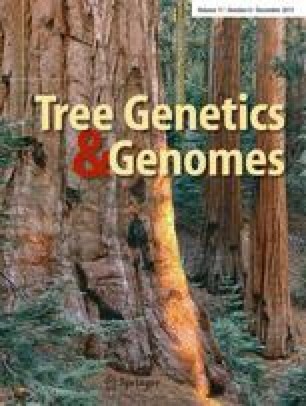 Strong genetic and storage effects were identified for all texture traits with significant interaction. Moreover, the structure of traits co-variations was preserved after storage. Based on the new integrated genetic map, numerous quantitative trait loci (QTLs) were detected, revealing multigenic control of fruit texture traits. QTLs were clustered according to the kind of texture assessment i.e. penetrometry, compression and sensory. Moreover, QTL stability over years and storage periods was investigated. Lastly, a short list of relevant texture traits, such as fruit global hardness and fruit deformation until skin failure, is proposed to optimize texture phenotyping for future quantitative genetic studies. The online version of this article (doi: 10.1007/s11295-015-0947-x) contains supplementary material, which is available to authorized users. This work was financed by the EU seventh Framework Program FruitBreedomics No. 265582: Integrated Approach for increasing breeding efficiency in fruit tree crops. Aline Tiecher was supported by fellowships from the Capes-Cofecub program. We thank Bernard Petit for meteorogical data collection from the station of Beaucouzé. The data was submitted to the genome database for Rosaceae (GDR). All genotypic data will be public under accession number tfGDR 1021.